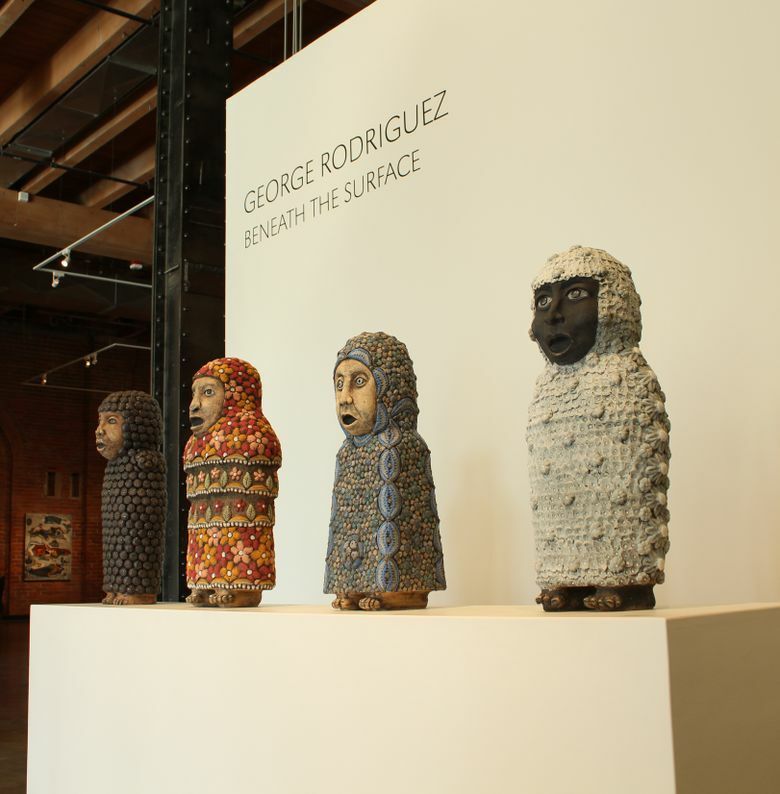 After receiving a travel grant from the University of Washington, sculptor George Rodriguez explored 26 countries in 10 months. His new show, “Beneath the Surface,” at Foster/White Gallery is the fruit of his journey. 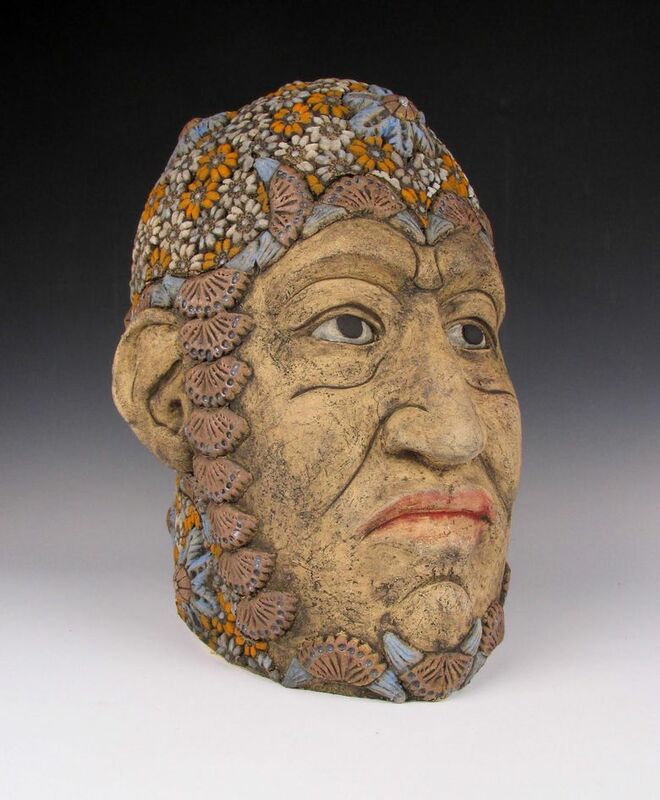 In 2010, the Texas-born and Seattle-based ceramic artist George Rodriguez got a travel grant from the University of Washington, which let him wander for 10 months through 26 countries in Asia, Africa and South America. 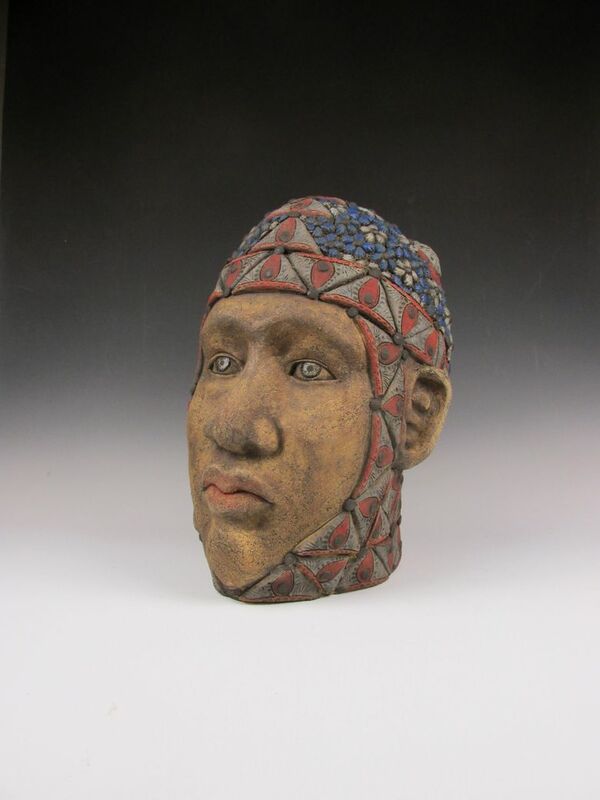 “I was able to feast my eyes on objects and cultures that I had only seen in books,” he wrote in an artist’s statement for his show, “Beneath the Surface,” at Foster/White Gallery. 10 a.m.-6 p.m. Tuesdays-Saturdays, through April 23 at Foster/White Gallery, 220 Third Ave. S.; Seattle (206-622-2833 or fosterwhite.com). For instance, Thai sculptures of Hanuman — a Monkey King who plays a pivotal role in the Ramayana — reminded him of costumes he saw in a parade in Peru. But the connections went beyond aesthetic affinities. “Beneath the Surface” is the fruit of his journey, and it reads like a temple consecrated to artistic traditions from every corner of the world. The show is rich, eclectic and lovingly crafted. It’s also a little obsessive. 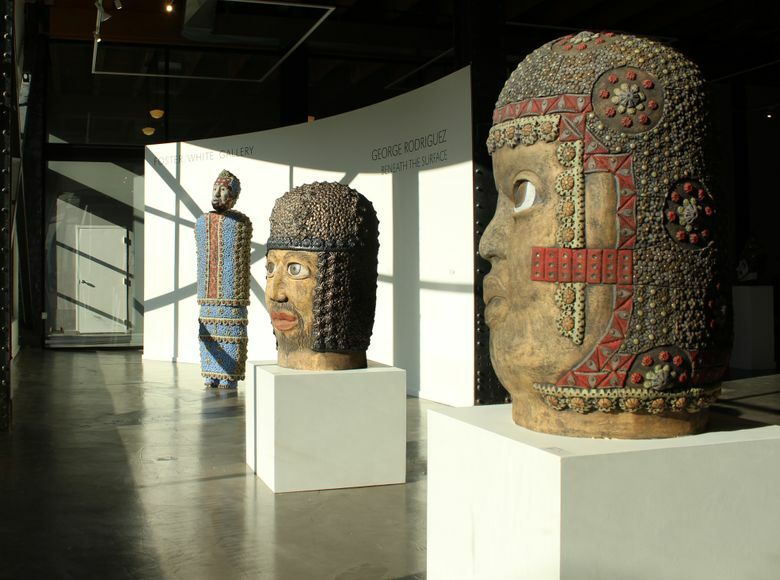 Its ceramic sculptures — mostly standing figures and busts — are as stylized as they are antic. Filling the room with playful energy, they simultaneously want to enchant you and elude you. The first thing you notice is Rodriguez’s huge jump in scale from his earlier work. “Sentinel,” standing over 8 feet tall, is a regal, meditative male figure, elaborately clad in a flower-brocaded robe. Serene yet alert, he strikes a beautiful balance between grace and vigor. Nearby are two heads, “Farhad” and “Zian,” nearly 4 feet high. “Farhad,” a Romeo-like figure from Persian mythology who died when he got false news of his lover’s death, has huge staring eyes and a wispy beard, and is crowned by a dun-colored, chainmail-tight headdress. By contrast, “Zian,” whose Chinese-derived name means “happiness” or “elation,” is adorned in more colorful fringes and straps. His expression is gentle; his upward-gazing eyes are saucerlike. Rodriguez’s decorative flourishes are busy but never overwhelming. While his work aims to be pleasurable and accessible, his ornate touches, he acknowledges, have a curious wrinkle to them. 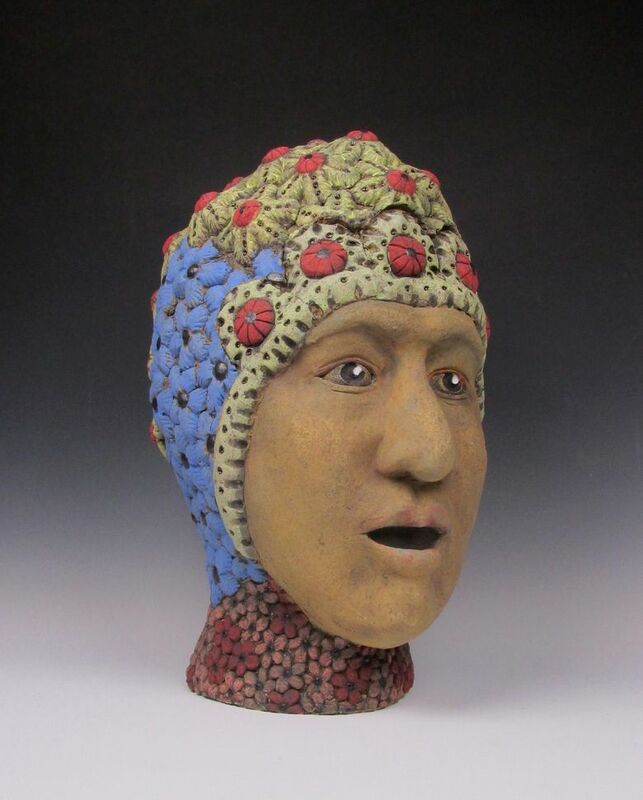 It also lends unity to “Beneath the Surface.” The facial features and headdress designs may vary significantly in color and expression, but they all seem part of the same fugue. They’re especially powerful when arrayed in a group. His four female “Companions,” numbered 6 through 9, form a chorus of sorts. Their mouths are open, perhaps in song. Their little, stubby feet poke out from intricately patterned tunics. Rodriguez subtly suggests some differences in age between them — the frailest and oldest, “Companion #8,” looks as if the tune she’s singing is the last thing she’s holding onto in this world. Two rows of masculine heads nearby offer sterner pleasures. “Mykyta,” “Serrao” and “Batu” have stoic, skeptical expressions. Formally arrayed, they appear neither easily bamboozled nor patient with fools. “Manco” and “Narmer,” on the other hand, are dreamier in nature. All of them wear the ceremonial garb of their cultures, but there’s something restless stirring beneath their outward conformity. For some, Rodriguez supplied oblique comments on their characters that add to the fun. 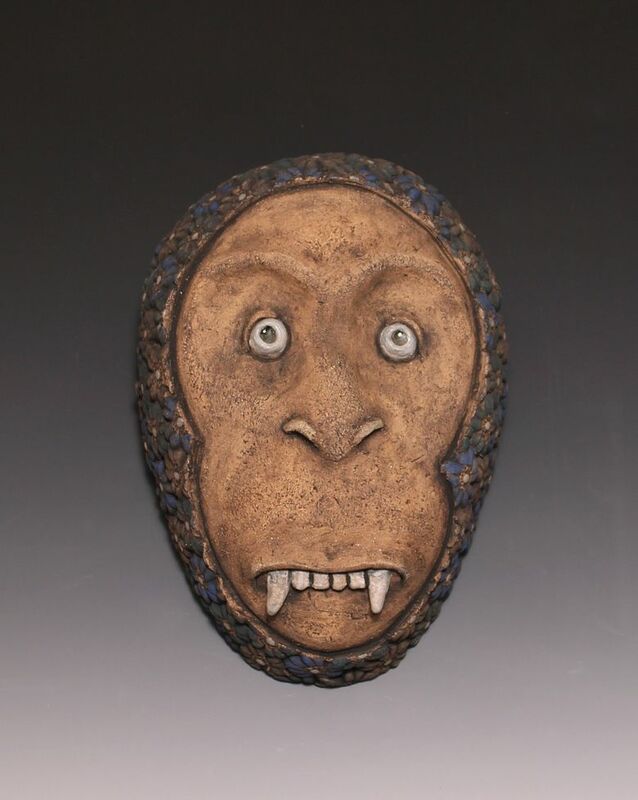 He’s at his most whimsical with his biggest group of sculptures — 16 monkey heads mounted on the wall. Some smile; some grimace. One, called “Toothy,” has a bit of the vampire about him.